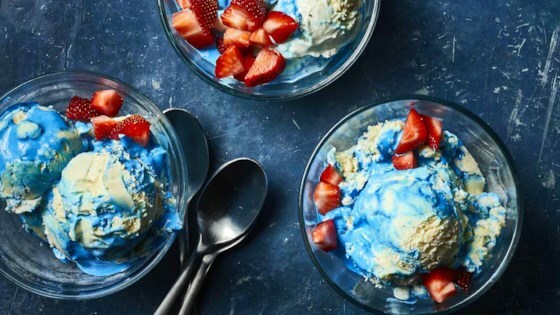 "Scoop up some fun this Fourth of July with these sweet red, white, and blue sundaes." Stir together marshmallow creme and 1 to 2 tablespoons hot water in a bowl until smooth. Add enough food coloring to reach desired color. Transfer ice cream to a large bowl. Stir with a wooden spoon to soften. Stir in blue marshmallow mixture to create a swirl. Cover and freeze at least 8 hours. Divide ice cream between 8 bowls or sundae glasses. Top with strawberries.